Stall Destinations is a search engine that provides an easy and efficient way for horse owners and barn facilities to connect. Stall Destinations— Horse Crazy People Helping Other Horse Crazy People! The founders of ‘Stall Destinations’ are all horse crazy people. Just counting the main brains behind the idea, we have over a century of ‘hard time’ in the equine industry. One thing we all recognized, albeit through diverse backgrounds, was the need for a central and convenient way to unite travelers with a friendly and safe place to house their equine companions. This was the spark and rationale, but just the inception. Our mission is to unite the searchers and hosts for equine accommodations in a mutually beneficial match. For the human on the search side, we aim to provide a service where you may find that perfect location for you and your horse, anywhere anytime, with just a couple of clicks. For humans owning extra stalls, we are streamlining the management process to market your facility around the world to gain additional income through the farm… but also enabling you to find boarders who are kind and respectful. Most importantly, for the horse, we hope our service affords them the most comfortable penthouse in town, with all the amenities their big heart’s desire--Our long term goal is not to just facilitate a rental between two equine parties— but to do so much more! How Can Stall Destinations Help Stable or Farm Owners? 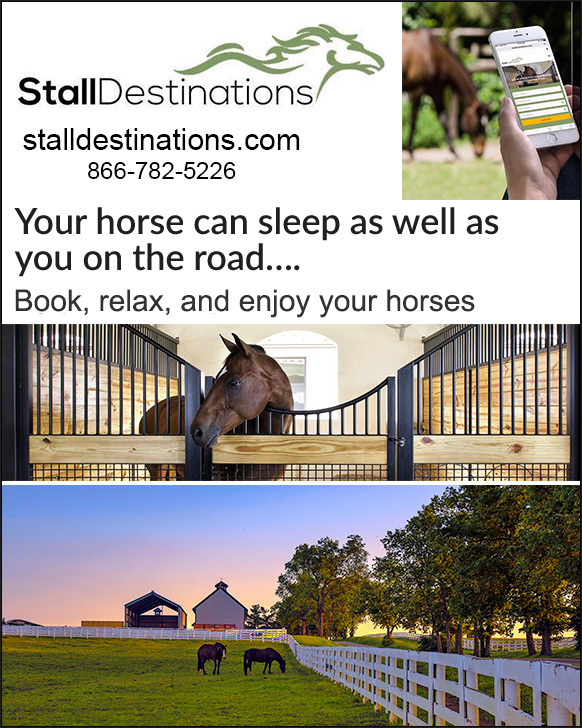 Stall Destinations is your go to website to list and rent stall(s) for your horse(s) while you travelling or are at a horse show. As we add facilities and users we plan to also include management software for barn owners and trip planning features. If you own a quality stable, with clean stalls, quality hay, clean water, and dependable staff, we would like to make your barn or stable a part of our Stall Destinations list of quality stalls available— you name your price and we only take 8% for the advertising and booking costs. Is there A Charge To Use The Information On Stall Destinations? No! There is absolutely no charge for listing your barn or for creating an account so you can search for rental stalls. You’ll love the convenience and want to tell all your friends. So How Does Stall Destinations Work? For those searching for stalls the services it totally free, for those listing stalls the services itself is free with no obligation or contract or exclusivity and once a booking is confirmed through Stall Destinations there is an 8% booking fee for facilitating the transaction. Are the Stables Listed on Stall Destinations Reputable? One of the top four goals for Stall Destinations is to facilitate a relationship between awesome horse people and amazing boarding facilities. In order to accomplish this, each party can provide a review of their communication, quality of stay and over all experience. We do everything possible to ensure that all stables listed are as “horse crazy” and dependable- as we know you are! What If I Have a Wonderful Stable, Can I List My Stable On Stall Destinations? If you have a great stable with clean stalls, fresh water, and great hay, we would love to have you. Basically you just have to create an account using your email and a username of your choice! You can easily upload a description of your barn, any show areas it’s near as well as photos so any potential travelers can see your amazing property and all of the facilities provided at your barn! The website is extremely user friendly and once you have uploaded your info your barn will be approved within 24 hours and then your listing will be live! What Do People Say About Stall Destinations? Stall Destinations has the potential to completely change the way we travel with our equine companions. It is an innovative start-up company that is solely focused on connecting equestrians and their partners with safe and reliable stabling when on the road. Make Sure That Stall Destinations Is Part Of Your Equine “Go To” TEAM Today! Every horse owner needs a team to help them with success… A great veterinarian, quality farrier, great stable manager, perhaps a solid horse trainer— and now you can add Stall Destinations to your TEAM of dependable companies and people to help ensure the health, well being and safety of your horse.